Agate gemstone with the beauty of nature embedded in it. 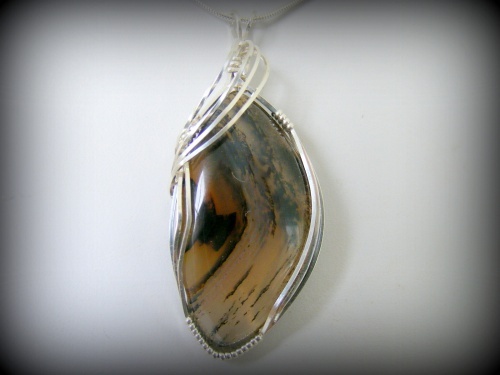 So pretty with its natural designs of golden browns and captured in a sterling silver frame and, topped with a silver swirl to match the lines in the stone. This piece is a treasure to own. Measures 2" from top of bail to bottom of pendant and 1" across. Comes with a sterling silver snake chain.